GLENDALE – John Slaney has played pro hockey all over the globe but he has a soft spot for the Valley of the Sun. "(Phoenix) was always my favorite city to live in," Slaney said this week after the Coyotes hired him to be an assistant coach on Dave Tippett's staff. "I always told my wife it was definitely going to be a place where I retire. There's no question about that." Slaney, 43, is far from retirement and his new gig with the Coyotes will keep him busy. His role on game days will be to watch games from the press box and communicate with the coaches behind the bench – Tippett, Jim Playfair and Newell Brown – on what he observes from that key perspective. Sean Burke, whose contract with the team was not renewed after June 30, served that role the past few seasons as Goaltenders Coach/Assistant to the General Manager. "I'm very excited," said Slaney, who was the ninth overall pick of the 1990 NHL Draft by Washington. "There's no question as a coach you always want to make it to this level." Slaney has been a coach since the 2011-12 season when he took a job as an assistant for the Portland Pirates, the Coyotes' affiliate in the American Hockey League from 2011-15. As such, he has gotten to know key prospects within the organization such as Henrik Samuelsson, Brandon Gormley, Philip Samuelsson, Tyler Gaudet and Louis Domingue. "Sometimes when they used to get sent down (to the AHL), I'd communicate with them, and I did a lot of communication with Jimmy Playfair, especially with the defense. Both sides (NHL and AHL coaches) are trying to work well and do the right things to get these young kids back up to the National Hockey League." John Slaney in 1997-98. Photo by Getty Images. Tippett said Slaney’s knowledge of the team's AHL prospects will serve the Coyotes well. "He knows a lot about players from Portland and was a very good assistant down there," Tippett said. "We just thought he'd be a valuable guy to add to our staff." 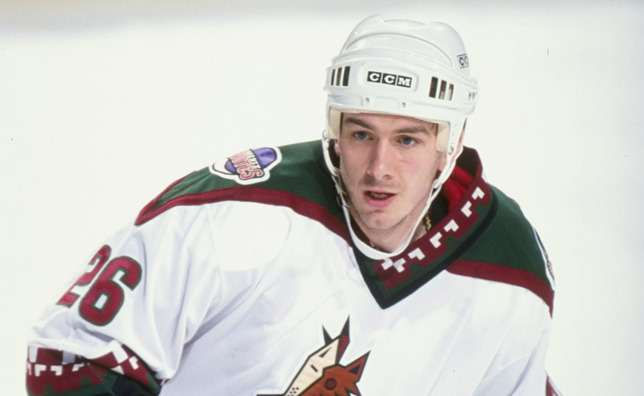 Before becoming a coach, Slaney, a defenseman, played 268 NHL games for seven teams, including 55 for the Coyotes in 1997-98. He also spent time in Arizona the season before that playing for the Phoenix Roadrunners of the International Hockey League. In addition, he played in Germany and the Czech Republic before retiring in 2011. Slaney, however, is most well known for playing and thriving in the AHL. Until being surpassed by Bryan Helmer, another former Coyotes defenseman, Slaney was the AHL’s all-time leading scorer among defenseman with 519 points (166 goals, 353 assists) in 631 games. In addition, he appeared in five AHL All-Star Games, and in 2014 he was inducted into AHL's Hall of Fame. "I'm just excited to be back in this organization and to help these young kids develop," he said.